Straddling the border of Germany and the Czech Republic, Elbe Sandstone Mountains were carved by erosion and are divided by the Elbe, which flows through them in a narrow valley. The mountains are made up of many microclimates, such as forested areas, plains, and ravines, providing astounding ecological diversity. Visit the national park and make use of the many hiking trails or cycle routes. Rock climbers are lured here by more than 700 summits. An eco-friendly streetcar limits car traffic inside the park. Use our Bad Schandau day trip tool to arrange your visit to Elbe Sandstone Mountains and other attractions in Bad Schandau. A real fairytale landscape... and unique natural spectacle! That there is something nice on our doorstep... have to experience every time! I had seen the Elbe sandstone mountains only on photos. This holiday region is relatively unknown here in the North. The trip was worth absolutely, it's a great landscape, these rock formations are really worth seeing and extraordinary. There are many hiking possibilities for people like us who are not so accustomed with the hiking. There are also historic as the fortress, as well as castles and much to discover. I will recommend it as a holiday destination. Whether in summer or in winter, always worth a visit. Many ways, something for everyone. Many prospects, some drugs accessible by car. Unweit der Elbflorenz Metropole Dresden. Nach langem habe ich nach dem Bastei und die Elbsandsteingebirge gesehnt. Ein einmaliger Landschaft in Deutschland. Die Elbe kannte ich bisher in Norddeutschland, und nun war ich hier und bin total begeistert von diese einmalige Landschaften. Eine aus Natur mit menschlichen Hilfe ist diese Bastei entstanden. Ein Felsformation mit dem Panoramablick der Elbtäler. Vom Rathenau Bahnhof mit der Fähre übersetzen, dann ein steiler Aufstieg an diversen Felsformationen vorbei. Nach ca. 1 Stunde ist man angekommen. Unweit des Basteis ist ein Hotel und Restaurant. Für die Personen die nicht ganz so fit sind, kann man bis zum Hotel hochfahren, jedoch bis zum Bastei sind es immer noch 10 Minuten zu Fuß. Wir sind von Dresden mit dem S-Bahn nach Rathenau gefahren. Zurück nach Dresden mit dem E-Fahrrad. ca. 35 Kilometer. Ein tolles Ausflugsziel! Close to the Florence on the Elbe metropolis of Dresden. After a long time, I have longed for the bastion and the Elbe sandstone mountains. A unique landscape in Germany. So far, I knew the river Elbe in Northern Germany, and now I was here and am totally excited by this unique landscapes. One occurred this bastion of nature with human help. A rock formation overlooking the Elbe river valleys. The Rathenau station ferry translate, then a steep climb on various rock formations passing. After about 1 hour you arrive. Not far from the raffia ice is a hotel and restaurant. For those who are less fit, you can drive up to the hotel, but to the Bastei is still 10 minutes on foot. We drove from Dresden with the S-Bahn to Rathenau. Back to Dresden with the E-bike. approx. 35 km. A great destination! Every day, we help thousands of travelers plan great vacations. Here are some tips on how to use your Listing Page to attract more travelers to your business - Elbe Sandstone Mountains. Promote your permanent link - https://www.inspirock.com/germany/bad-schandau/elbe-sandstone-mountains-a320700197 - on your website, your blog, and social media. When a traveler builds a plan from this page, the itinerary automatically includes Elbe Sandstone Mountains. This is a great way for travelers looking for a great vacation in your city or country to also experience Elbe Sandstone Mountains. Promoting your link also lets your audience know that you are featured on a rapidly growing travel site. 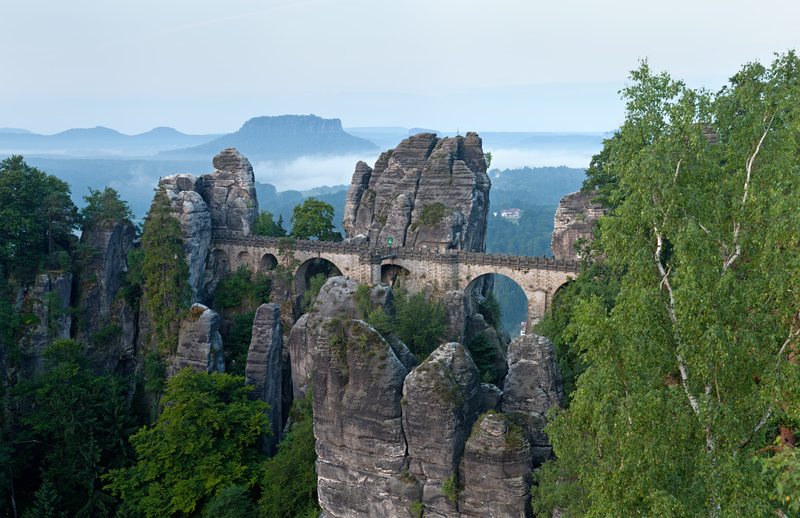 In addition, the more this page is used, the more we will promote Elbe Sandstone Mountains to other Inspirock users. For best results, use the customized Trip Planning Widget for Elbe Sandstone Mountains on your website. It has all the advantages mentioned above, plus users to your site can conveniently access it directly on your site. Visitors to your site will appreciate you offering them help with planning their vacation. Setting this up takes just a few minutes - Click here for instructions.